Helen, a visiting volunteer alumna, took the following picture from Tehri Road near South Hill. We do see cows around with regularity; in fact, they can be nuisances. Owners of cows in the area let them wander during the day to find vegetation to feed on. This picture is amazing! It is a bit difficult to tell, but the hillside that the cows are feeding on is almost vertical. Somehow these cows made their ways up or down the tiny paths and ended up perfectly aligned. On a quick trip to the bazaar on Monday we passed this wall being built. The location is behind the Kulri Methodist Church on the short-cut road down the front side of the hill, avoiding the bazaar congestion. It didn't look very sturdy as they were building it, but maybe it will last through at least one monsoon. 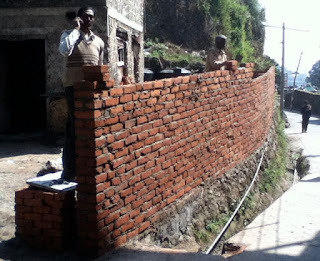 Notice the worker near the front is on his mobile phone. 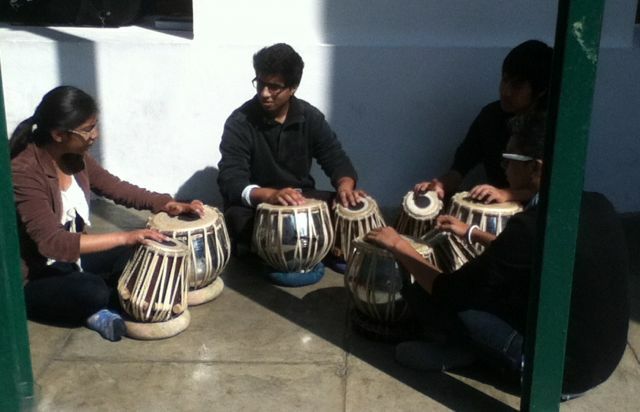 These four students were practicing tabla (Indian drums) in the Quad the other day. The sun was bright, so the shadow is quite stark. Many of our students take Indian music lessons. This afternoon (Wednesday) Dan will be sitting in on the auditions for the Advanced Student Recital, coming up in a couple of weeks. There are 32 students trying out!